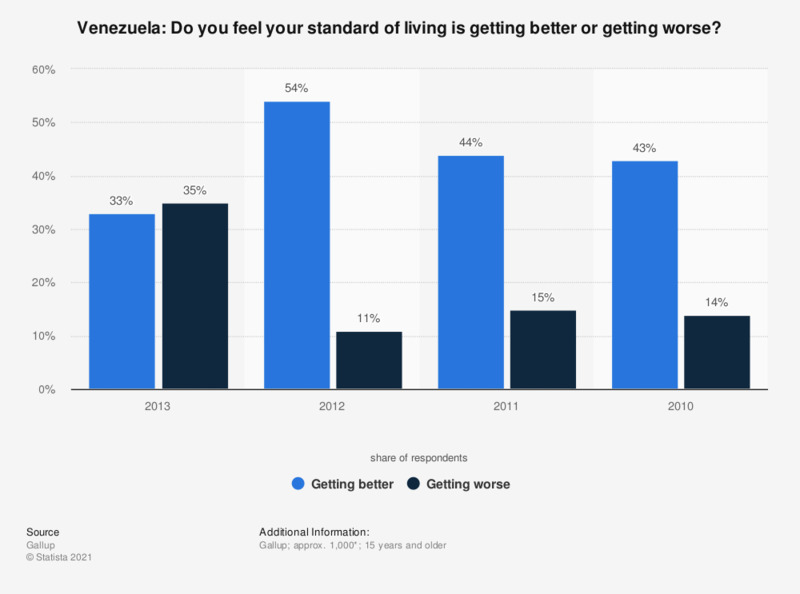 This statistic shows the results of a survey conducted in Venezuela from 2010 to 2013 on the standard of living. In 2013, 35 percent of respondents said the standard of living was getting worse. In 2012, only 11 percent of respendents said the standard of living was getting worse. *The source does not provide information on the number or age of respondents from 2010 to 2012. Living standards of young adults and their parents at the same age in the U.S.
Venezuela: Do you feel safe walking alone at night outside? How would you describe your living standard compared to your parents' at your age? Do you think the next generation in Britain will generally enjoy a better or worse standard of living than their parents do now? Do you think the economic conditions in Venezuela are getting better or getting worse? Venezuela: Do you have confidence in the judicial system and courts? Has life since the 1960s in the U.S. changed for better or worse?